The Sea Angling Diary Project is enlisting sea anglers from across the UK to help improve the marine environment through better management of fish stocks and demonstrate the impact of sea angling on the country. With over 1,300 anglers already providing information through a bespoke, free online diary, the project is seeking to significantly expand numbers to improve the quality of information. Anglers of all abilities are being asked to sign up - whether you’re a time served, year-round dedicated sea angler or you fish in the sea occasionally, maybe on holiday. The project, which began life as Sea Angling 2016 is now running through to at least the end of 2018 has been re-named the Sea Angling Diary Project. Information gathered will be used to calculate the numbers of people fishing and where and how often they do it; and the economic value of sea angling to the UK economy. Crucially it will show what is caught and where – and the proportions of fish returned as well as kept - to show the real impact of angling on the environment. Free log in to a unique Online Catch Diary Tool to record fishing trips and catches and support in using the diary. Diary Kit comprising: a Sea Fish Identification Booklet; waterproof catch recording notebook; tape measure and guidance to recording catches. Personalised Online Dashboard summarising activity and catches and ‘End of Year Report’ on all your sea angling activity in the year. EVERYONE who signs up receives a FREE copy of Sea Angler magazine direct to your door! Prize Draw – for everyone signing up by February 2018. 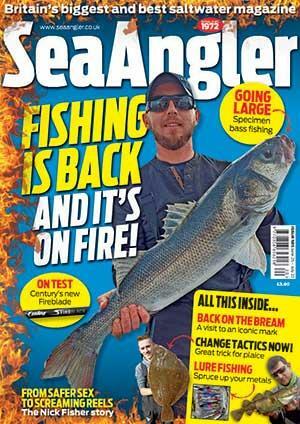 Quarterly Prize Draw - every three months - 500 electronic copies of Sea Angler magazine to be won! The survey is funded by the UK Governments and commissioned by the Centre for the Environment, Fisheries and Aquaculture Science (Cefas). It is carried out by research company Substance, who have undertaken a wealth of research to show the impact of angling and support its development in the last decade (www.resources.anglingresearch.org.uk). Information collected will be published and provided to European, national and local policy makers to make better informed decisions on fisheries management, as well as provided to the sea angling community with information to enable them to develop their own views and policies. Results from 2016 are due in November. The project is supported by a wealth of angling organisations, including: Scottish Federation of Sea Anglers, Welsh Federation of Sea Anglers, Fishing NI, Angling Trades Association, British Sea Fishing website. It reports to Dept of the Environment, Food and Rural Affairs (Defra), Marine Scotland, Welsh Government and the Agri-Food and Biosciences Institute in Northern Ireland.